"Nowhere in the New Testament does it say that a Christian leader, because of title or position, has moral authority over another Christian." "The church of Jesus Christ in the 21st century is losing its power to transform lives because of an infatuation with spiritual and moral authority that pastors take over people," writes Wade Burleson in his recently published book Fraudulent Authority: Pastors Who Seek to Rule Over Others. Wade has been serving as lead pastor at Emmanuel Baptist Church in Enid, Oklahoma for nearly 25 years. Authoritarianism in the church has become the biggest challenge Christians face in the 21st century. So-called "spiritual authority" in leaders who demand people submit to their will and ways in the name of God, is tearing at the fabric of legitimate New Covenant Christianity. Church leaders present themselves as the vicars of God, spokespersons for the Spirit of God, and the human embodiment of Divine truth. This fraudulent spiritual authority–the basis for Christian leaders "ruling over" other Christians–permeates much of the modern evangelical church structure. Biblical church leadership is important because without it, God’s people are like sheep without shepherds. Governments have authority. Kings have authority. Presidents have authority. Leadership in these systems of governance comes from those sitting in positions of authority. The church of Jesus Christ was never designed to operate in this manner. Jesus explicitly taught in Matthew 23:8-11 that the only person who rules over Christian communities is the Lord. He is our Teacher. He is our Leader. He is our Instructor. And what about the third person of the Trinity? Why do those who heavily promote 'elders' so rarely mention the work of the Holy Spirit in the lives of believers? I have been intrigued by how many churches there are that are abandoning congregational forms of government and placing all authority over church life into the hands of few individuals. This practice is particularly perplexing in two kinds of congregations: those that have been congregational (Baptist) in the past and those that are upstart non-denominational congregations. In the former, congregations are abandoning their historical roots for a system that empowers a very few. In the latter, the few that are empowered have no denominational over-sight to keep them in check. One of the great travesties of these systems is that frequently those in power require membership contracts of their congregations that place certain leaders in authority over others. Wade takes these issues on from a Biblical perspective and shows how we are all equal at the foot of the cross. 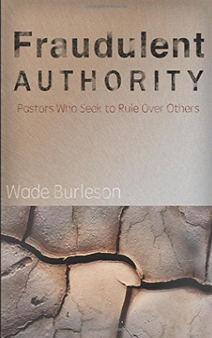 Wade Burleson goes on to explain that Christians emulate pagans when they turn their homes, churches, and organizations into 'structures of authority' where everyone is coerced into submitting to someone else's authority rather than to Jesus Christ. Instead of New Covenant believers being equals, Old Covenant forms of authority are imposed on 21st century Christians. 3). Disagreement with leaders is deemed a sign of the devil's influence in one's life. 5). Any concept of equality is immediately labeled rebellion or the result of a "liberal" demian of the Bible. 6). Authoritarian leaders are only comfortable around like-minded leaders; thus, there is an unofficial 'speaking tour' where only imperial, authoritarian leaders share the platform with each other. I attend Chuck Swindoll's church in Frisco, Texas. This past Sunday he indicated that the biblical way to choose Elders is for them to be hand selected by the existing elder board (slowly, carefully, with many investigations and with God's leading). He specifically called out Southern Baptists indicating that the Bible does not sanction congregational voting for elders/deacons and specifically that women cannot be elders. What are your thoughts? Make no mistake, this is a growing trend in Christendom. When my younger daughter was entering college in the fall of 2010, she asked my husband and me to go with her to check out a church that was close to campus. It was part of the Acts 29 Network. At the beginning of the worship service, the lead pastor stood before the congregation and named a couple of men whom he (and probably a couple other church leaders) had decided should serve as elders. There was no input from the members whatsoever! They were to trust their leaders. Wade further emphasized that Jesus Christ is the Head of His church, not these leaders who are mimicking Old Covenant Judaism in form and function. In our upcoming posts, I plan to share what Wade has to say about a very important topic discussed here at TWW – Church Covenants. Hint: Wade Burleson (who pastors a large Southern Baptist church in Oklahoma) shares a handful of reasons NOT to sign such a covenant! Should you want to order a copy of Fraudulent Authority, it is available in paperpack and through Kindle. Excellent book. Read it recently. And, first? Great book! A great resource with lots of Scripture to use as references. Get a copy and keep it handy! “What’s with Paul & Women: Unlocking the cultural Background to 1 Timothy 2” by Jon Zens. It’s a great parallel study to the Fraudulent Authority book by Mr. Burleson. They seem to address both sides of the same coin. Also on Amazon….It really is a great book also. I believe there are only two critters mentioned out in the field, sheep or wolves. If 9Marks leaders do not want to consider themselves sheep then by default they must be wolves. I was able to read about half of it this weekend. I’m looking forward to finishing it! And thank you, Molly245, for the Paul and Wonen book suggestion. So many good books, so little time! I’m so glad we only “stuck” six years before making a decisive, complete break and gong to a much healthier church body. We knew better than to try to explain ourselves, ask questions, anything. Just wrote a kind letter and left it on the office desk with my church key (a teacher privilege). I read Fraudulent Authority several months ago and its excellent. Wade does an excellent job of exploring the Scriptures and how these authoritarian movements are blatantly ignoring Scripture while proclaiming themselves “more biblical” than everyone else. The Kindle version doesn’t seem to be connected on the same page as the paperback, but it’s free to Amazon Prime/Kindle Unlimited subscribers. If you click on Wade’s name it comes up in his list of books. Might want to add the Kindle link, too. I actually have no problem with a church being led by a group of elders. The key thing is that elders must be appointed by the congregation and the congregation must be able to remove elders. Otherwise, there are no checks and balances to prevent abuses of power. Any approach to church leadership that doesn’t have an effective system of accountability is a recipe for disaster. Wade Burleson has been a voice of compassion and reason for the SBC for a long time now and it has cost him. But when I think of how he spoke up for the missionaries who were asked to ‘sign’ the BF&M 2K or to leave, and when he spoke out against the treatment of Dr. Klouda by Patterson at SWBTS, and how Wade took the part of women against the abuses of patriarchy; then I know he is on the side of the angels and remains a light in an entity under attack by a kind of authoritarianism that bears no resemblance to Christian ministry. The SBC should be very, very grateful that Wade stayed and became a voice for good. I’m Catholic and I don’t agree with Wade on a lot of theology, but I see in him a Christian spirit willing to stand up for people who are being persecuted and that is for me, the sign of a Christian leader. I hope he goes from strength to strength and that his soul remains intact in this world where so many have wandered from the Good Way. TWW is fortunate to have Wade for an E-Church minister. When I heard he was, I knew TWW was coming from a good place. “”“For he who endeavours to amend the faults of human weakness ought to bear this very weakness on his own shoulders, let it weigh upon himself, not cast it off. then I know he is on the side of the angels and remains a light in an entity under attack by a kind of authoritarianism that bears no resemblance to Christian ministry. The SBC should be very, very grateful that Wade stayed and became a voice for good. I’m Catholic and I don’t agree with Wade on a lot of theology, but I see in him a Christian spirit willing to stand up for people who are being persecuted and that is for me, the sign of a Christian leader. Christiane, I appreciate your kind words for Wade and his stand against fraudulent authority. I encourage you to seek wisdom and truth regarding the authority structures in your Church, so that you too may stand for those who are spiritually abused in your sphere of influence. I urge you to not fall under the influence of the James Whites and the John MacArthurs in relation to my Church. I think you have been heavily infuenced by those who make their money from hawking anti-Catholicism on the ‘circuit’ and I have given already an example of this. If anything, I think this blog points out how ‘authoritative’ abuses are seen in many arenas where men have walked away from Christ Himself and have ceased being ‘servants of the Word’ and servants of the servants of God. I think professional anti-anything is suspect, when there is money to be made to hawk lies and mis-information to people who devour it and are willing to pay for it. Honestly, you have listened to the wrong voices about Catholicism. There are enough REAL differences that separate Christian people that are important and honestly true, without having to make up mis-information. There should be some electing going on, imo. That Chuck Swindoll quote is ridiculous. I do go to a church with elders, but they are elected and they rotate out, so they’re always changing. Also, women are elders. I am curious what they say in this book about Paul and the book of Timothy since that’s one of the ones scholars think he didn’t actually write. There are Elder-lead churches, then there are Elder-RULED churches and it is worth making a distinction between the two. The problem is not so much the model of elder leadership as can be found in scripture (been in churches that get that right but they are increasingly rare), but rather the execution of that model that is seemingly being attempted AND botched with increasing frequency due to the influence of 9Marx and other Big Eva organizations. When you have authoritarians like Dever, Chandler, and others in positions of authority and influence, of course they are going to attract others that would seek to have the rule over congregations. This is happening more and more, as the Marie Notcheva episode and others on this blog have illustrated. For all the hurt they’ve caused, the current big church celebrities don’t concern me nearly as much as the generation of pastors that will come after them and have been brought along under their influence. That was also illustrated by Marie’s episode. I encourage you to seek wisdom and truth regarding the authority structures in your Church, so that you too may stand for those who are spiritually abused in your sphere of influence. I agree with Dale on his assertion and am in no way a fan of White or McArthur. Quite the opposite. The structure of the RCC is heirarchies on steroids. Right down to a Theocracy. And a closed system. A lot of people in megas just thought if they had the right leader all would be well. They ignored the fact that the structure, the system is the real problem. In such Byzantine structures, one person can present an good public image while the system itself remains corrupt due to its structure. Ingrained thinking. Pope as Vicar of Christ. Pontiff. It’s not “misinformation”. It’s your system. You can put lipstick on it but it’s there. A closed system. You have been an effective evangelist for it. Maybe that’s still true here in the west, but globally the biggest challenge I see is the various types of overt persecution. Of course, the wolves will always persecute the flock of Christ via their predation, often by forms of authoritarianism, though not always. I think a lot of the problem is that they are moving non-elder led denoms to elder led ones, so their are not proper structures in place. Couple that with the fact that their entire motive for changing polity is authoritarian and it is no wonder they are making a mess. I think in old school Baptist churches, Deacons filled the biblical ‘elder’ role mostly (minus the ruling aspect). “We teach and define as a divinely revealed dogma that when the Roman Pontiff speaks EX CATHEDRA, that is, when, in the exercise of his office as shepherd and teacher of all Christians, in virtue of his supreme apostolic authority, he defines doctrine concerning faith or morals to be held by the whole Church, he possesses, by divine assistance promised to him in blessed Peter, that infallibility which the Redeemer willed his Church to enjoy in defining doctrine concerning faith or morals. Therefore, such definitions of the Roman Pontiff are of themselves, and not by the consent of the Church, irreformable. Christiane, this is directly from Vatican I. This is infallible EX CATHEDRA teaching of Pope Pius IX. I pray that you will have the temerity to reject this usurpation of the authority of Jesus Christ. I can assure you, you will not be accursed or damned. Maybe that’s still true here in the west, but globally the biggest challenge I see is the various types of overt persecution. I agree with this. Persecution is very high in eastern countries, and I don’t think Western Christians really pay much attention to it. I’ve been wondering lately how I can be more aware of it, but for safety reasons, often we don’t hear about much of it. The very fact that we are seeing more negative reports from believers than positive ones coming from New Calvinist elder-led governance, is evidence that this church polity is not ordained nor blessed by God. Jesus specifically called out the doctrine of the Nicolaitans which had crept into New Testament churches, which placed overlords in authority over the people. Nicolaitan rule in the early church led to antinomianism, claiming that grace removes moral boundaries in a believer’s life … which is why Jesus said He hated the doctrine of the Nicolaitans! In some corners of the American church, New Calvinist belief and practice resembles this teaching. Hoping our conversation will steer away from commentary about the RCC since that is NOT the topic of this post. Thanks for your cooperation. Sorry, Deb. Didn’t read your memo before posting. Sorry! I thought fraudulent Authority in the church was the topic. I thought fraudulent Authority in the church was the topic. I have been in congregational churches, old time Baptist. Then in a denom which is a mixture of sorts (UMC) and now in a denom with a hierarchy (TEC). I have my own personal opinions as to what the bible does and does not say about church structure and governance, and I have my own personal opinions as to what works for me-what I am willing to put up with. I believe that there is a pretty large market for a church structure that includes some sort of authoritarian structure. There are people who like that and want that and think they see that in scripture. I am not willing to ‘blame’ the elder led movement solely on ‘elders’ imposing it on totally unwilling congregations. IMO there are two sides to this coin, the leadership being one and the congregants being the other, and portraying the congregations as all one way in their thinking would not apt to be correct. Look at the divisions among us in the recent secular issues over governance-and right on. The american people do not agree on governance-either inside or outside the churches. I am all for finding ways to co-operate where we can, both inside the church sphere and out, even if we disagree on how churches ought to be organized and even whether they ought to be organized. It is interesting so watch (from the other side of the Atlantic) how the secular world views and political preferences have made such a deep impact in ecclesiological matters (not only in the SBC, but there especially so). Democracy may be a secular means to balance and check potential dictators (really, US citizens? how many of the 45 presidents were killed in office? four? sounds very democratic to me), but this way of reasoning has no place in the Church of Christ (not: Churches of Christ, I know). In His Church His Word and His Spirits reign and rule. So: look into His Word and obey. No feminism there. No democracy. No dictatorship, but an organic group of people humbly serving one another. I was almost laughing (but was rather embarrassed) to see arguments based on experience rather than based on Scripture. Americans are pragmatists, are they? Since “Abusus non tollit usum”, your examples and experiences are no argument against the NT teaching and command about a plurality of qualified (!) men serving as elders. Could you also please recognize that Mark Dever is a confessing congregationalist, he is neither a democrat nor does he endorse authoritarian leadership. The imperatives of the Lord by Peter and Paul make clear that there is authority in the local church and that there is a people (a flock!) that obeys their example, teaching and preaching. Since elders got their authority from God (Christ, the Head of any real church), they have no absolute authority. Real elders do not get their authority by a democratic vote of members (how anachronistic). The accountability principle does not mean that elders cannot have and serve with authority. “Pastors” = shepherds = elders (in Biblical terms anyway) are accountable to one another and to the Arch-Shepherd, as Peter makes it clear. And people unqualified for their role/ministry in the church have to be removed from their offices. They may need more training and discipleship with exemplary ministers. You may read your Bible, try to acquire sound hermeneutics to interpret it rightly and bow to it as the WORD OF GOD. A little help may be Alexander Strauch’s book “Biblical Eldership”. There you will find at least “some” sound exegesis IMHO. Maybe your would-be/like-to-be/already-employed elders should study these matters, live them and THEN teach them soundly. I feel sorry and sympathize with all Brothers and Sisters under unbiblical leadership. I once almost died because of it (acquired cancer!). I had to leave this church. How elders in Presbyterian churches can usurp power: garner elder nominations from the congregation (remember that current elder wives may nominate). Screen nominees. Those who are not “on board” with current elders are removed from consideration. Present the slate. Voila-you have some congregational involvement in elder selection that means nothing. The elders’ nominees were selected! Max, I don’t like this neo-cal stuff, but that doesn’t mean that there aren’t plenty of non-elder led places that are abusive. Are you really sure it’s the elder thing you have a problem with, or the overall sense of creeping authority? It’s far too easy to just blame the elder-led polity, but I think when you do you are missing some very important things. I am not one bit surprised about the fraudulent authority occurring in Southern Baptist Churches. When the FUNDAMENTALIST took over the denomination it was only a matter of time till their poisoned minds affected the seminaries and now the churches that these poisoned minded ministers are trying to pastor simply on the basis they are the Authority. Excellent post.. A step further is the issue of the Church budget.. I will regular attend a Chruch that does not fully present the Church budget, and let the congration vote on it!! I’ve given some thought to this post, and it occurred to me that it has always been asked of the people of my faith to consider three things before making important decisions based on the realities and the issues we faced in our live. the ‘Church’s teachings’ were always to be carefully considered and pondered in our hearts. But there was another consideration t . . . our consciences needed to be consulted. His conscience is man’s most secret core and his sanctuary. ‘Authority’ may teach, it may offer guidance, and give direction, but for a Christian person, no ‘authority’ can ever take the place of his or her own moral conscience. I wondered what was troubling me about this discussion . . . and it looks like perhaps for many who are not of my faith, there is little or no recognition of the supreme importance of informed ‘conscience’ as moral guide, within the whole tradition of mainstream Christianity. Our God has made us better than that. A remarkable insight and helpful comment; particularly knowing your background. I wish all of us would examine everything we cherish in the same manner. Ignorance of Christ and his Gospel, bad example given by others, enslavement to one’s passions, assertion of a mistaken notion of autonomy of conscience, rejection of the Church’s authority and her teaching, lack of conversion and of charity: these can be at the source of errors of judgment in moral conduct. knowing ‘what the Church teaches’ is only ONE factor. Considering the reality of our personal situation, praying to the Holy Spirit for guidance, and in the end, coming to terms with our OWN moral conscience …. we can’t make a moral decision and say ‘I had to because the Church told me to.’ Essentially, we are alone with God when we make that final decision after all prayer and consideration, yes. That privacy the Church does not deny. And that the followers of those pastors take over everybody else. The idea of authority and conscience also confronts the issue of ‘responsibility’ for our actions. I think that is something that belongs in the conversation also. Any ‘authority’ that tells you what to do against your own conscience …. they aren’t going to be there with you taking the heat when you face your Maker. So ‘doing what the Leadership told me to do’ won’t hold up as a defense in any court …. not even the Court of Heaven on the Day of the Lord. If we sin, it’s a willful thing … no one makes us sin. Well, you and I are living in the West, on the home turf of these Pastor-Dictators. So locally, they ARE the biggest challenge. So ‘doing what the Leadership told me to do’ won’t hold up as a defense in any court …. not even the Court of Heaven on the Day of the Lord. Actually, it would hold up in one place & time — German bureaucracy of 1870 to 1945. And even then, you’d have to produce a paper trail proving that the Leadership issued you direct orders to do so. What moral decision have you personally made that was contrary to the teachings of the church? Or is all this hypothetical at least for you in your own experience? What makes me curious is that you mention conscience rather a lot more than others commenting here, and I don’t understand how this issue of the ability to disagree with the church in matters of conscience would get to be all that big a deal with somebody outside of personal experience either for the better or the worse. I personally have made one or more moral decisions that were contrary to the teachings of scripture, and lived to regret it, which explains some of my ideas about conscience and moral decision relative to scripture. I was wondering if you are speaking from personal experience also? I attend Chuck Swindoll’s church in Frisco, Texas. This past Sunday he indicated that the biblical way to choose Elders is for them to be hand selected by the existing elder board (slowly, carefully, with many investigations and with God’s leading). He specifically called out Southern Baptists indicating that the Bible does not sanction congregational voting for elders/deacons and specifically that women cannot be elders. What are your thoughts? I followed Swindoll through his writings when he was local to me in SoCal. At the time, he seemed to have his head screwed on straight. All I can figure is Swindoll has been corrupted. Oh, boy. I don’t have an Amazon acct, but my daughter orders stuff from Amazon all da time. I may have to have her order Fraudulent Authority and the Paul and Women book for me!!! I could download the books onto my iPad, but if my iPad crashes, I lose the books. I want hard copy! As far as I know, ungodly church hierarchy authority is not prevalent in the rural county where I live. But, there are 9marx/acts 29 churches in the more heavily populated counties that surround us. So, it’s only a matter of time. However, the fraudulent authority of men over women is everywhere! Any ‘authority’ that tells you what to do against your own conscience …. Remember that scripture relates a time when “every man did what was right in their own mind.” And scripture reminds us that there will be a time when man’s conscience is “seared.” So hopefully we are not saying that “let your conscience be your guide” is the rule by which to live. I do not give a hooty hooe what Swindoll or any other pastor of his like mind think any more. Either they believe this nonsense about there should not be congregational voting in Southern Baptist Churches and that heaven forbid a woman be an elder or they are afraid if they saw otherwise it will hurt their cash flow. 1. An individual with a charismatic personality (frequently narcissistic) decides to start a church. 2. He enlists a handful of supporters to be in on the ground floor as Elders. 3. The church incorporates under by-laws giving all authority to the Pastor and his hand-picked Elders. Succession of Pastor and Elders is through appointment by the existing Pastor and Elders. 4. The church grows as people are engaged by the charisma of the leader. 5. An established church now exists with a congregation with no say into matters, regardless of how they have invested of themselves and their resources into it. Also, there is no denominational oversight. 6. (Snark alert) Once the kids are hooked on the programs the non-optional membership covenants are rolled out. so I have come to trust it as a guide, yes. The problems came when I ACTED impulsively without giving my conscience it’s proper role in my life. So, for all major decisions, I try to give plenty of time and take all factors properly into consideration so as not to not make shipwreck of my faith. It helps. I’m not perfect, no. Maybe we see ‘conscience’ differently? For me, it’s a guide. Either they believe this nonsense about there should not be congregational voting in Southern Baptist Churches and that heaven forbid a woman be an elder or they are afraid if they saw otherwise it will hurt their cash flow. Either way, they are Corrupted. Whether by the more direct corruption of money/cash flow or the more insidious corruption of POWER and Ideology. So hopefully we are not saying that “let your conscience be your guide” is the rule by which to live. I don’t think the word ‘conscience’ is seen the same way as I see it in the evangelical community. Although I think there is some understanding of it’s role … maybe in that phrase ‘the priesthood of the believer’, or some sense of the integrity of a person’s choices being made in consideration of what they know to be right and good ???? Surely the human soul is imprinted by God with a guide leading us towards doing what is right and avoiding what is evil ….. I think this is a universal thing among all human persons. And when ‘authorities’ dismiss the dignity of human persons, they then begin to undermine the person’s faith in their own judgment, so as to take over making decisions for that person …… that is where I see the biggest problem in the mis-use of authority: the denial of the dignity of a man’s conscience and value of his ‘soul competency’. Just like Madison Avenue did in the days of Mad Men. Because children don’t have an off switch or channel changer. Never mind the obvious Bait and Switch. Possibly so. I have heard what seems to be your approach to conscience over and over from the pro-choice people; it ultimately depends on the situation. And I have heard the denunciation of what seems to be your approach over and over again from those who preach against ‘situational ethics’. I am quite sure that influences my thinking. Oh, I am not disagreeing with at all–they are corrupted! Ultimately this comes down to good governance. The church (whatever denomination) is a human institution run by humans. Like any other not-for-profit there needs to be checks and balances. One of those balances is a member elected board. The pastor (head pastor if there is more than one) should be ex-officio to the board. A non-voting member responsible for the spiritual well being of the church. All expenses should be fully transparent for members. Of course these boards can be co-opted too but they can also be questioned. I think in the cases of independent non-denominational churches (at least the ones in my area) the pastor is often the founder and as such treats it like a family business with himself as owner (I suppose there could be female founders but the ones in our area appear exclusively male). It’s one of the reasons I would never consider joining one. Either God said it (bible horrifically true) or he didn’t (bible false). It’s something that I struggled with when I was a Christian and have never really been able to reconcile. As someone who’s been raised in a late 20th /early 21st century liberal democracy, that has been more of stumbling block of faith than who’s running the church board. I suspect that I’m not alone. I think more of us have left than realized and we’ve left the playing field to the hard liners (in all denominations). In many ways it’s refreshing to read the opinions expressed here to know that there are more than a few tolerant, like-minded questioners. Those questioners are sorely needed and the faith needs to figure out a way to draw them back (hint: it isn’t the 9 marks). BTW: Wade’s book “Radically New” also addresses several topics that would be of interest to TWW Readers. This shows up on many more fronts than just ‘abortion’ or ‘women’s health’ issues. The idea of the sanctity of life extended to its maximum expression would, if at all realistically possible, among Christian people mean that a person should not be put to death by the state. But for some reason, those who are totally in ALL cases opposed to abortions sometimes see the death penalty as not conflicting with their beliefs at all …. we call this narrow view the ‘sanctity of pre-born life’. Very interesting to look at where the lines are drawn for who makes decisions for whom and in what circumstances and why. The devil is in ‘the conflicts’ and there we are put to the test the most. Conflicted ethics require a whole ‘nother level of insight and wisdom ….. I would say here is where the Holy Spirit’s help is most important to Christian people. The devil is in ‘the conflicts’ and there we are put to the test the most. Now I could be wrong about this, but I think the conflicts in various situations occur as the result of misunderstanding the role of the government (both federal and state) and expecting them to abide by the same moral judgements as we do as Christians. If the “law” of the land sees abortion as legal, Christians will be in conflict. If the “law” of the land sees the death penalty as legal, Christians may disagree, but recognize the right of the governing authorities to protect it’s citizens from crime/criminal, thus abiding more to the “eye for an eye” type jurisdiction as was foundation in the law of Moses. The reason would be that the death penalty is assigned to people who have murdered someone else, usually more than one person or in terribly horrific ways. Which unborn children have not done. No mystery there. Not that I want to get off on this topic. Do not make the mistaken assumption that all the issues of abortion, death penalty, military pacifism, assisted suicide, triage, self protection, pull the plug on the respirator and such are part of some ‘sanctity of life’ philosophy for everybody. That may be the case for some people but certainly not for all. IMO ‘sanctity of life’ is a catholic idea and would not apply to most protestants. And certainly no idea of ‘life’ itself outside of the human species being sacred in some way, like don ‘t step on the bugs, and stop and put the maggots back into your infection-that is not protestant thinking. I would never have known that if you hadn’t mentioned it. Can you share why ‘most protestants’, in your opinion, do not buy into the concept of the sanctity of life? I thought there were Bible verses affirming it, many verses. I thought things were the same in the regard for life among all Christian people. Good observation Max. I’ve seen this authoritarian nonsense play itself out in the Calvary Chapel cult where the ‘Moses Model’ holds sway ,and they’re not even remotely Calvinistic. A clique of yes-men elders all hand picked by the strong-man in charge, carry out the honcho’s wishes to the letter. They (reformed or arminian, it makes no difference) claim the Scriptures as their ultimate authority when in fact the practice is not much more than 40-45 years old. To Timothy were given the earliest instructions for orderly arrangement in the church, these instructions being of the simplest nature, and, as Dean Alford well observes with regard to the Pastoral Epistles as a whole, the directions given “are altogether of an ethical, not of an hierarchical kind”. These directions afford no warrant whatsoever for the widespread organizations of the “churches” as carried on today. That may be the case for some people but certainly not for all. IMO ‘sanctity of life’ is a catholic idea and would not apply to most protestants. Catholic idea? I would beg to differ. I believe it (sanctity of human life) to be inscribed in the innermost conscience of all humans regardless of tribe, religion or creed. I would consider it part and parcel to the Almighty’s creative act of making us a little lower than the angels and crowned with glory and honor. I am talking about the idea that all biologic life is sacred, key word ‘sacred’ and therefore to be preserved at all costs regardless. I do not think that most protestants are against the death penalty, a subject you brought up, or that most protestants would deny an abortion for medical reasons, or for sure that most protestants would disapprove of birth control for example. Catholic ideas which protestants do not tend to share. If these all come under some umbrella term of sanctity of life, then no I do not see that in protestant thinking. And if failure to sign on to these concepts means that one does not believe in said sanctity of life, then it is obvious that most protestants do not sign on to these concepts and therefore do not believe in sanctity of life as you have apparently defined it. “I attend Chuck Swindoll’s church in Frisco, Texas. Who meets the 17+, very, very, tuff Qualifications, for elder/overseer? Given by Paul to Timothy and Titus? The 17+, very, very, tuff Qualifications, for elder/overseer? Qualifies? According to 1 Tim 3:1-7, and Titus 1:5-9? I applaud Wade as a leader and a Calvinist for writing such a timely book. I do agree with him that this is the number one problem in the western church. The abuse of authority is harming many sheep and is scattering the flock in confusion. Humility and real repentance is needed in leadership for their worldly attitudes towards many things. It is just plain selfishness that is producing lots of bad fruit. I also find it an interesting paradox that Dee and Deb and some of the commenters here speak so negatively constantly about Calvinism and yet post up a weekly e-church which includes messages from a Calvinist pastor. While I have questions about Calvinism and do not believe it to be true, demonizing it I do not find to be the truth either. My best friend is a Calvinist. He is not in any way a “Calvinista.” The problem is much bigger than Calvinism. KP Yohannan with his Believers Church and Gospel for Asia fits the whole abusive leader pattern for one. Many abusive leaders have never been Calvinists and never will. I honestly think some here are going overboard with their pitchforks in hand. The problem is a spirit which is ancient. It is the same spirit that was behind the Pharisees in Jesus’ day. This spirit corrupts God’s church by sowing false leaders into the church. The problem is not primarily of a theological nature, but a spiritual one. How are we going to triumph over an enemy if we are misidentifying it? While I have questions about Calvinism and do not believe it to be true, demonizing it I do not find to be the truth either. Yes, I have issues with this too. Although it’s certainly interesting to talk about what we believe one way or the other, I think it obscures the problems to blame ‘neo-cals’ issues solely on the Calvinist bent. That is clearly not the problem here. It may sometimes contribute, but I think that’s more in their interpretation of things which is not always correct. But the authoritarian and patriarchal leanings are more of an issue than polity or theology in the broadest sense. You have different sets of Calvinists coming up with radically different types of churches. And then of course you have the fundamentalist non-Calvinists who can be just as much of a problem. I think the type of authority mentioned by Wade above is different from the authority experienced in churches and Christian organizations. The authority above is based on law and not the individual. For example, it is the law that gives the policeman the authority to write a ticket for speeding. In churches and Christian organizations it is elitism that provides the basis for the authority. The leaders simply claim that they know better because they are elitists. The Athenian Greeks predate, by about 400 years give or take, the Christian church & while their idea of citizenship was different than ours (equality wise) they practiced democracy. Nice name. I got one just like it. I had the same problem. They were carpenter ants. Black/brown with pointy heads. Kind of bigish. The usual remedy doesn’t work so great. They were in water damaged wood under a window. You’ll need to find the nest and dust it with pyrogenic powder & repair/replace the damaged wood. Then seal where the water is coming in to prevent more damage. Or make them sign membership contracts & they’ll eventually leave on their own accord. Whenever the authority figures puff up their chests it is a good time to read some George Fox. Not what his followers the Quakers came up with, but his own principles. I was almost laughing (but was rather embarrassed) to see arguments based on experience rather than based on Scripture. Americans are pragmatists, are they? You claim what you say is biblical, and yet, I saw no Scripture supported in what you said. The only reference you gave was a book by a modern author, and while I read and enjoy many books, I do not consider them a substitute for Scripture guided by the Holy Spirit. “Original” Jack is correct–democracy predates the church, which alone renders your entire argument invalid. More than that, Jesus made it very clear that those who minister in the gospel were to abase themselves as servants. Mark 10 is quite instructive on this, when Jesus tells the disciples that His kingdom looks nothing like the world. There are no leaders, but servants, and even Christ Himself came only to serve others. The veil was torn at the death of Christ to symbolize that we no longer have need for hierarchy, and the Holy Spirit came at Pentacost to instruct individual believers. Preaching was necessary at that time because many people were illiterate, but in this day and age, the Bible and the Holy Spirit are all that’s necessary to seek God. Wade pretty much obliterates all of your arguments about elders in the Bible in Fraudulent Authority, which is the post of this post. But even I, a mere commenter, can read the Bible for myself and determine what it says without an elder or pastor to guide me. What does that have to do with democracy? And people unqualified for their role/ministry in the church have to be removed from their offices. And how to do you expect that to happen in cases where they are all corrupt? Or simply wrong. a church can always call it the Board of Directors. If said church is hung up on ‘biblical’ boxes to check, then no “elders” may philosophically free them up to incorporate women. but, of course, i think in most cases it’s more about fear of women and male insecurity than it is about being ‘biblical’. i think in many cases “biblical” is simply something to hide behind. Nah, they’re just wrong. The word for “elder” in the Bible is an adjective that can be any gender, and it’s translated both masculine and feminine in 1 Timothy 5. And in Greek, whenever something is masculine, in can refer to a group of people of both genders. BTW, “elder” just means “elderly person” in Greek. This idea of it being an office isn’t accurate, either. And in most of these elder-run churches, the “elders” are nowhere near “elders”. I would say that if your elder board is universally or mostly younger men, then it’s a blatant contradiction to Scripture. nd in most of these elder-run churches, the “elders” are nowhere near “elders”. I would say that if your elder board is universally or mostly younger men, then it’s a blatant contradiction to Scripture. I should clarify that I mean in most of these abusive elder-run churches the elders are often younger men. But I think many churches suffer from ignoring their elderly members in favor of the trendy and charismatic. No. They’re elect. They’re irresistibly drawn to Christiane’s kitchen. shhhhhh ….. they might hear you!!!!!!! I was just thinking that Swindoll’s argument for carefully choosing elders by elders is really meaningless if the original set of elders chose themselves or were chosen by the pastor. If the original elders are not credible, then how could you trust that later elders would be chosen according to the Bible? But most of these authoritarian churches focus on “husband of one wife” and “overseer” and leave out what follows: “He must not be arrogant or quick-tempered or a drunkard or violent or greedy for gain” Titus 1:7. I think that verse alone disqualifies 95% of neo-Calvinist pastors, elders, and theologians, as well as many other authoritarian church leaders. Yup, IMO the more authoritarian are the ones where you’ll nary find an elderly elder. But I think many churches suffer from ignoring their elderly members in favor of the trendy and charismatic. I agree. I think true elders are supposed to be older, decent men and women whose lives we could emulate. That’s the model we were given. My son is dealing with his Baptist church up in Fort Worth, near the Baptist seminary. They are trying to control every aspect of his life. He is getting fed up with it. I told him just now that they have no say so over his private life, who he dates, who he doesn’t and how much he gets involved in the church. He’s a grown man in his late 20’s. I think he knows right from wrong. I keep telling him that he may need to find another church to go to. He’s thinking about it. I reminded him that the only one he answers to is God. They had him having 2 accountability partners. In my opinion this is wrong. They had him having 2 accountability partners. In my opinion this is wrong. This is cult behavior. Get out! They had him having 2 accountability partners. Nonsense! Tell him to run. Also, do they only assign these ‘accountability partners’ to men? I have never heard of them being given to women. Above….run, run hard….and don’t look back…. As in “Fraudlent Authority = Romish Popery”? I taught several students who are Neo-Cals and now are either in the pulpit or staff. Calvinism was the easiest way for them to take total control. Young, starry-eyed, and on fire for the Great Mass Movement That WILL Change the World into Utter Perfection! Sixty years ago, it would have been Communism instead of Calvinism. Eighty years ago, it would have been Fascism. A Century ago, it would have been Socialism or Anarchism. The leaders simply claim that they know better because they are elitists. Just like the Pigs of Animal Farm. It’s likely two are assigned to singles, because of course we are living in sin and rejecting authority by being single and not following the gospel of complementarianism. I bet single women also have accountability “partners”, as we wouldn’t be capable of anything without someone to tell us what to do. When church structure and doctrine legitimize high levels of authority, it seems like certain abuses are a given. I don’t see doctrine/theology/denomination offering any check. When there is a hierarchy with high levels of authority, there is abuse. I have one accountability partner and, I have to say, he does a fantastic job. I’m also in Dallas, and at the time I left my “gospel-centered” church, the small group leader decided each night we would send each other texts and say if we did or didn’t do that thing single guys are known to do that day. There’s no way a young man develops the confidence to do the work of the saints being treated like a psych patient, but I think that’s part of why some men subject themselves to this. Tell him to send his signed resignation letter and if anyone wants to have a “meeting” him, they can stick it. I go to a conservative UMC now with a completely mixed small group. When women go off to women’s retreats… In fact, a friend of mine and I were talking in the foyer. When women go to women’s retreats, they just get encouraged. “You guys are awesome. You can do it! All right!” Men get blown up. You go to a man thing. You’re just going to hear how much you’ve failed and how bad you stink and why the whole world is broken because you’re so worthless. That’s kind of how we do it, and it’s the right way to do it. And remember, they think it’s an utterly baffling mystery why more young men leave the church than women. In Jesus’ time, the religious authorities are the ones who put Him on the cross. – a friend who spontaneously began to speak in tongues in a Bible study group and they kicked her out. – another who was miraculously healed (positive biopsy, and at surgery, completely healed – with medical reports documentation) and the clergy buried it, since miracles disappeared after the first generation of Christians. This leadership had the arguments to “prove” this. Just because Paul’s letters speak of ‘elders’, doesn’t mean you gotta’ have em’. Don’t get me wrong, if it floats your (generic your) boat to have elders than by all means install them, I believe in freedom. All I’m saying is that the NT Epistles are not a warrant* in and of themselves to make elders a ‘must have’ type of thing. *nor is the Bible any guarantee that you’ll get good elders. I kind of see it (and who am I? nobody!) as the old testament was the tutor that lead us to Christ. It’s like a step, maybe, of the world becoming mature. All of the things that were done- they did not work to make human beings and human society good, it’s been illustrated. The same themes that happened in the OT come up over and over in human thinking: If the slate were just wiped clean and we could start over- with good people -start the world off right and run it right this time… If we punished evil doers severely enough, put them to death, wipe them all out if they are bad enough… If the people just had the right rules to live by, it would cause them to live righteously… If there was a priesthood to lead the people, show them the right way… And so on. People still believe that the same things could make a difference in this world. But as is illustrated, the problem is in the hearts of people and none of these things can change that. We do stupid things, we do selfish things, we hurt each other. Finally we see: love is the answer. Redemption. I don’t know, that’s sort of an idea that I get from reading through. But I won’t say that I don’t struggle with the things that happened; I do. We tend to be the outcasts from the system, questioning and doubting are not appreciated inside. It feels so much more free once you’re outside. I think true elders are supposed to be older, decent men and women whose lives we could emulate. That’s the model we were given. Isn’t the clue in the word itself? My former complimentarian church had “elders” in their 20s. In that, I was merely speaking to Swindoll’s argument alone. Swindoll stated that churches could only have good elder boards if they were carefully chosen by the previous elders. But if the initial elders chose themselves, which I bet is likely for even Swindoll’s crew, then his argument has no merit. Based on 1 Timothy 5, and the description of “lists”, I believe elders mean anyone of good character who are elderly. It’s not a “board”, and they’re not a controlling authority. They are humble servants whose lives Christians should emulate. (T)he clergy buried it, since miracles disappeared after the first generation of Christians. This leadership had the arguments to “prove” this. Why do those who heavily promote ‘elders’ so rarely mention the work of the Holy Spirit in the lives of believers? Same answer to both – they tend to be Reformed cessationists for whom the only genuine manifestation of the Holy Spirit is in (theologically correct) preaching and (properly administered) sacraments. I am familiar with the arguments for cessationism, and found them thoroughly unconvincing even in my TR phase. And the neo-Cals don’t believe in sacraments, either. So only the pastor must have the Holy Spirit. Except they keep turning out to be morally corrupt! Just a little correction. I do not call myself “a Calvinist.” In your comment you refer to me as “a Calvinist” a couple of times. I realize it is all “in the definitions.” I believe in Christ. I believe in grace. I believe in the Scriptures. But when it comes to Calvin, I part with his view on authority, the union of church and state, eternal punishment, and a host of other issues – however, I really like the spirit of your comment. I, too, have very good friends who self-identify as Calvinists, and I believe the issues are much broader. I would trust very few Christians to be an accountability partner. You are not ready to be an elder when one is in his or her 20’s or maybe even thirty’s. one is still wet behind the ears and very inexperienced as far as life goes IMO. Maybe two are assigned to single men. I have NEVER heard any woman, single or otherwise, say she had an accountability partner. Maybe they get those weird fake husband elders? They’re super common in the shepherding movement. We had a shepherding movement cult in college and they were always trying to get the girls in my dorm into their chain of command. Maybe women now have replaced that with MLMs? Make money and control your friends? I reminded him that the only one he answers to is God. They had him having 2 accountability partners. In my opinion this is wrong. Why would a grown man be assigned people to whom he had to ‘answer’? That word ‘accountability’ suggests that your son is not able to manage without supervision from other people ….. but what was his crime? What did he do to come under such a ruling where he must answer to not one but two other men in the Church? It’s ‘controlling’, yes, but it’s also shaming and punitive and belittling of his manhood and his dignity. that is NOT a healthy situation emotionally for that individual. ‘Shaming’ someone doesn’t create ‘humility’ in a person, but it does attempt to destroy their self-esteem. Shaming a person just builds up the sin of pride in those who do the shaming. The kind of sinful pride that cannot respect the dignity of ALL human persons as something vital to the Church. Except if you are an Ideologically Pure True Believer. Well, we can actually communicate without being marked as wicked, evil, unkind, disobedient, backslidden, unbeliever . . .
the problem is in the hearts of people and none of these things can change that. We do stupid things, we do selfish things, we hurt each other. Finally we see: love is the answer. Redemption. We had a shepherding movement cult in college and they were always trying to get the girls in my dorm into their chain of command. And they called them ‘accountability’ groups? So weird. Maybe women now have replaced that with MLMs? I don’t like this neo-cal stuff, but that doesn’t mean that there aren’t plenty of non-elder led places that are abusive. Are you really sure it’s the elder thing you have a problem with, or the overall sense of creeping authority? Agreed. There are plenty of creepy authoritarians in non-Calvinist churches as well. They will show up wherever there is an opening. Elder-led governance provides a system where one so inclined can set up camp more easily; congregational polity provides a recourse to send them packing. However, either system can fail if unspiritual folks are in both pulpit and/or pew. The Bible is clear that we need Holy Spirit filled leaders – I just wish we had more these days. The Bible is clear that we need Holy Spirit filled leaders – I just wish we had more these days. …We Will Finally Achieve True Communism! Consistently these men show they abhor other people’s right to tell them NO and escape them. I think that is one of the big reasons they became preachers, because they know they are the kind of men people want to say no to and escape the most. It infuriates them. It is a toxic miserable life having a man in it that doesn’t want you to be able to say no to him and escape him. It is not a life worth living. So, the church chose their servant-leaders. Being full of the Spirit and wisdom was prerequisite. If that was so in the early church, it should be so today. There’s just something about New Calvinist churches with a 20-30 year old “lead pastor” hand-picking 20-30 year old “elders” that doesn’t ring true to the New Testament model. Anyone who ‘seeks’ leadership to control and manipulate others, especially through intimidation, is not a man after God’s own heart. Membership covenants which serve as a mechanism to outline the parameters of such pastoral rule over others are not sent from Heaven. The only covenant a believer needs in his life is the one Christ wrote in blood for him … you don’t need to sign anything else. *Special insights from God? Check. Vision casting is rampant there, including some plans of creating businesses that tithe profits to the church, as well as a specific growth number goal to achieve. *Concern about numbers and success? Check. Besides the number of pew sitters that God revealed to him in a “vision,” he forced “Operation Andrew” on the congregation in order to manipulate pew sitters to manipulate their acquaintances to come to church. Surprisingly, there’s been no membership covenant, though that’s probably in the pipeline as we speak. Oh yes, the church also has an “advisory board.” The congregation did not choose members of said board, and I only know of one person on the board – a guy who occasionally preaches (I don’t know his qualifications besides that he screams even more than the lead pastor) and one time said that the congregation needed to be like Navy SEALS when it came to evangelism. So at least one “advisory board” member is cut from the same cloth as the leader. Similarly, the sub-leaders for his ‘Family Tree’ shepherding scheme were hand picked sycophants with no input from the congregation. The guy I was supposed to be under was the token “Yell ‘Amen!’ at everything the pastor says” guy. And as an aside, the pastor tried to call me again last Saturday, even though I’ve been gone for over three months now. I didn’t even answer my phone and the only reason I keep him in my contacts list is so that I know when it’s him trying to call so I know not to pick up. Always amusing when a church uses the title “Senior Pastor” when he is in his early thirties and it is his first post as what we used to call THE Pastor. The New Calvinists prefer “Lead” Pastor … they like to make it clear that they are the Man who gets to exercise authoritarian leadership over others, including other pastors, elders, and members. “Senior” implies age, wisdom, and ministry tenure – which would not typify a young reformer. Do they think God cares how loud the sound system is? Or about the lights? Other than God, who is church for besides the people in it? Another point to consider in all of this “authority stuff”. I know of a number of chruches that have YEC explicitly in their “core belief”, or “statements of faith”. If you are member of one of these Churches, especially if you sign a “membership contract”.. they could “displine” you for believing the earth is old. Supposed you are a petroleum engineer, engaged in looking for oil? The oil companies specifically use current old earth understandings to find oil.. and guess what, it works! Given that many of these types of churches are conservative politically, this poses a direct contridivtion of “drill baby drill” and YEC… I would not want to be such an engineer.. go to work and use old earth science, and the go to church and agree to a statement of faith that states the opposite??? When talking to these kind of men – they are physically sitting across from you but they feel up and above you about 100 miles away. That feeling is being sent to you by them, even if by some chance they are doing it subconciously, I always sensed they were aware of it and doing it on purpose, but maybe I’m wrong. It’s a pretty distinct feeling in how they talk to you (tone of voice – usually cold/unaffected, measured cadence, robotic pre-planned scripted-like phrasing versus natural, personable dialoguing and language, thought processing, exchange of ideas). Standoffish in how they posture themselves/body language and the overall elite spirit and vibe of their demeanor permeates and dominates the conversation structure and physical environment. They often control and choose the conversation, thus oppressing good convo and instead making if off-centered and stifling any human connection. Deep issues are reduced to surfacey cliches. In all this they are never letting the conversation go where it actually and probably should go even though you should probably be the one leading it if anyone should be “leading” the convo at all. They also talk to women, especially women in their 20’s-30’s, like they’re children and blank slates. Though infantilization and “blank slating” people is common toward everyone when you minimize or oppress priesthood of believers and have a controlling hierchial environment (and all that spiritually assumes, that the people in power are spiritual deciding everyone “lower” than them) there was this special kind of confusing social hell as a young single woman around them. I always thought I was losing my darn diddely mind during and after conversing with one of these men because of all that I said above on its own, but also the layer of their beliefs about women and inserting God (in the unspoken) through the back door behind all their social games with you. As a woman you often have this vague sense that you’re being scapegoated for some theological reason or for some personal issue they are having in their own life that has nothing to do with you. But you can’t pinpoint it because its masked and covertly projected on you in a systemic way and the power dynamics and covertness are as such that there’s little to nothing you can do about it. And sometimes in general whether you are female or male, they can just be hiding stuff and you trigger them as the kind of person who would expose or see through them so it triggers a kind of low level, veiled hostility and hinted sneer behind their words even though they probably could not tell you why, or likely they would self-deny they are doing it. The overall power dynamics in conversation are stark and prohibits any possibility for real confrontation and relational equity. So instead you have to constantly strategize as a dis-empowered person while trying to call it out and that has to be a strategy in itself and is highly exhausting. You know and see way more than you’re letting on but you have to slowly chip away at the structure, you can’t just overtly call it out, too risky. Eventually if none of this works you have to leave the dynamics and go elsewhere and know what to look for and escape from sooner the next time. While in these groups, I carved out sainthood level patience (or despondency, gave up?) to sustain myself socially and I also have a naturally goofy big smile and look more dumb than I really am lol!, so they probably couldn’t pick up and sense my inner dialogue/inner screams. People can generally intuitively tell when they are being condescended to and are being treated poorly. But for some reason, when people do it in the name of God and theology and ecclesiology we tend to normalize it and excuse it and accept it. Sorry! A few mistakes in my post as typing on phone. I don’t know why I stayed so long myself, except that it was a gradual change for the worse over about three years – the pastor picked up some bad habits from the megachurch celebrity pastors he was hoping to emulate and began applying them in his own church. Since the guy is a “vision caster,” my guess is that he thinks God gave him a vision for the church that included the exact decibel level of the music and the exact placement and colors of the lights. And it’s a seeker-driven “We need to make church hip and fun and attractive to non-churchgoers!” type of place. I’ve always had trouble with the way that Christians seemed to immediately accept the word of someone who was a pastor, or even wanting to be a pastor, especially in Baptist circles where pastors mostly appointed themselves to ministry. I’m usually the single women these guys avoid, because they can’t argue with me and win. I don’t like arguing, but I won’t be pushed around. Not a few have seen me as an easy target before they knew me, and they quickly found out otherwise. There was one guy that used to try to back me into walls, because I think it was the only way he felt like he could “win”. Plus, I like getting out my Greek Bible. A lot of these guys don’t really know the Bible at all, and focus on studying the words of people like Piper, so they have giant holes in their theology. -What importance is Jesus in your theology? -What are the core tenants of Jesus’ ministry? -How goes the gospels of the Bible reflect on the rest of Scripture? -Do you study the Greek? And I’m really impressed you typed all that on your phone! I went to a church that was fairly lax on most things, but for some reason they made the music a dividing issue. It was so loud my ears hurt often, and I’m not particularly sensitive. They provided ear plugs, and to anyone who had trouble, they told to wear ear plugs, and that was the only concession they would get. Parents were asked to keep their children out of the sanctuary during service because the music was so loud. They did have a “overflow” room where you could watch the service, and sometimes I went there just because it was too much. I really didn’t get why it had to be so loud. What benefit does that provide? Is it psychological manipulation? What? Great comment. Your experience resembled my own in many ways, but my age is a multiple of yours. Not saying what multiple. 🙂 I hope that this epidemic has burned itself out way before you reach my age, but I have no idea how long it will take for those harmed by this false gospel of power to recover. Emily, in reading your comment, I can only say that association with an institution like that is 100% voluntary. Neither you nor anyone else needs to subject themselves to that kind of nonsense. It really is up to you. God is his Psychic Spirit Guide? Jeffrey J–I really appreciate your comments re YEC. I grew up in an SBC church in the oilpatch in the 50’s and 60’s. We marked our Bibles up gleefully at all the places scripture agreed with geology, which of course is very much old earth. Part of the attraction was that the SBC did not expect you to check your brain at the door. And that did not mean it was screaming liberal by any means. The local SBC is YEC and very much into conventional psychology. To the point that they try to address physical brain injury, major mental illness, and hormonal mood issues (estrogen, testosterone, and even thyroid effects) with human centered psychology. I reached the point I could not stomach one more “we know the earth is less than 10,000 years old because the Bible says so” or one more “if your intestines are tied in knots and you can’t sleep you have to talk to someone about the issues in your past” without screaming. Now, yes, issues may effect us. But duh, not all physical diseases are caused by how we respond to emotional issues, and not all mood disorders are stinking thinking. One of my children has not one but three brain disorders, and I refuse to expose any more of my family to such drivel. Or to look for a dinosaur in my back yard. Since the guy is a “vision caster,” my guess is that he thinks God gave him a vision for the church that included the exact decibel level of the music and the exact placement and colors of the lights. So THAT’s where the Voices in His Head come from! And it’s a seeker-driven “We need to make church hip and fun and attractive to non-churchgoers!” type of place. Until someone else comes along with a Hipper, Funner, and More Kickin’ spectacle. It tells me there is some sort of “issue”…… does using the word “senior” or “lead” make them feel more important?? And if so, why does it matter? Why not just use the title Pastor–period? This seems like a well written and researched book, hope to get it and read it. Thanks for posting it. I am sure it will be helpful to people. Thank you and… Thank you Chubbs for pointing that out. You are so very correct. I love your whole comment- I feel like I’ve lived it and you describe it so well! I’m anxious to read this book. I was told by someone who attends a church with membership covenants that the church did it on advice by a lawyer so they wouldn’t get into trouble if they refuse to do gay marriages. A quick google search put the lie to that. I am kind of amazed the freedom of conscience a Christian would be willing to give up just out of fear of a gay marriage might happen. They will use any issue to give them an opportunity to do church the way they wish to. Which means the only presence of the Holy Spirit since Jesus ascended in the clouds, is via the clergy? This is theology? I was told by someone who attends a church with membership covenants that the church did it on advice by a lawyer so they wouldn’t get into trouble if they refuse to do gay marriages. That sort of thing should be addressed by amending the church’s by-laws or constitution, rather incorporating such language into individual membership covenants. There is no reason in the world for a believer to sign a membership contract with a church; they are already members of the Body of Christ by their profession of faith – no written contract needed! There are Elder-lead churches, then there are Elder-RULED churches and it is worth making a distinction between the two. Indeed! The “elder-rule” model typical of New Calvinist churches is the bad-boy of the two. Leading and ruling are totally different … a genuine servant-leader of Christ would never have “rule” in mind. With the talk about Elders, I’m reminded of this. Paul writes to Churches @ Rome, Corinth, Galatia, etc. He never mentions Elders. Leadership is discussed at length in letters to Ephesus and their main leader, Timothy. Including the bit where he tells Tim to stay. Don’t leave. Apparently, the Church @ Ephesus was a mess, and leadership was a challenge. And most of our principles on how to govern all churches are gleaned from writings to one specific highly dysfunctional church, with major male/female conflict. How should Elders be selected in a healthier context? Maybe bring everyone together for a meal, and see who people gravitate to? Who do people seek out when they have problems? Who has age and wisdom and character and can help others because they have decades of experience? They are Elders. These type of men assume women are inferior intellectually without ever getting to know them or caricaturing them constantly so they can’t ever get to know them. Then it’s awkward for them when they get “surprised” that she’s at their level or superior. Why is it a surprise? It could never be a surprise if you view women as equal and seek them out to see them as they really actually are. Their social structure (even if it comes out subtly) is set up on the assumption that women need their help to think. On top of that single women are often assumed to be more helpless and lost (also often plays out subtly), so the preemptive condescension and posturing is especially thick. And yes, I agree and find that men who are this way also lack critical thinking skills and are guru oriented. I think the foundation of critical thinking is empathy and love, and that is not there for them, hence defensiveness and sexism and power mongering and attitudes, and so on. In a case “where all are corrupt” or all are “simply wrong” how come that you are (still) a member of such a “church”? 2017 is a good year to remember (500 year German reformation) that there are times when being excommunicated from a church gone south is a blessing. Think Luther. But blessed only, if this is caused and guided by obedience to the Lord and His Word, another lesson learned from the reformation. In the end, if HE is not in a “church” it is an empty temple. By that I do not mean that a church is only a Christian church if there are no problems, see the epistles. The Lutheran Protestant Church (of old, I mean) was not an ideal church either. Why? Reformation is an ongoing project: Ecclesia semper reformanda est. In my post I never said “what I say is biblical”, just read it. But I repeatedly referred to the ultimate standard of the Word of God. Alexander Strauchs book was not declared to be Holy Scripture or a substitute for intensive study of Scripture (far from it! ), but rather as a help to start/continue to “search the Scriptures”. Strauch at least does not argue with cultural or political arguments but tries to exegete Scripture. That IMHO is the right approach to any problem in the NT church. And just for the records: This emphasis on Scripture (The Truth) does not set aside the other means of Devine Grace, but require them all. How would you define and realize an approach of having and using authority without being authoritarian? Is this a possibility? What says Scripture? Where is the fine (or, big) line between authoritarian (leading to abuse) and good authority? Of what practical use is the Lord’s teaching about shepherd(s) and sheep ( a flock)? Of leading and feeding and protecting (and and) and of being lead, fed and protected? I got the impression some may think “authority is always evil” since it inevitably leads to abuse? Why then did so many American Christians vote (indirectly) for President and “Chief Commander”? (No, I do not want to discuss any person in the office of President). Care needs to be taken in reading scripture if one uses assumptions validity of something in scripture based on how many times is something mentioned in scripture and precisely to whom something is addressed or not. Whether that is important or not is a delicate decision. The virgin birth is only referenced in two gospels. No epistles. Baptism is mentioned, but inference must be made as to how and when and at what age and with how much water baptism is to be performed, because there is no commandment or precise description in the NT regarding that. The lord’s supper aka holy communion aka the eucharist is mentioned only in terms of how not to act and in reference to the original event. So does that mean that repeat passover once a year or that we do whatever just so long as we remember the death of Christ while a ritual meal, or exactly what and how often and in which procedure do we see spelled out in scripture. Some people have used a flip comeback ‘How often does scripture have to say something for it to be true?’ Well, let me add, where does it say for each statement in scripture whether it applied only to the immediate target audience at the time and place it was originally said or when does it represent a general instruction of everybody? Scripture does not spell that out; we have to try to figure it out. Look up all the answers in scripture where some statement has been made to the question and what must someone do to be saved, and what you find is various answers; no set and comprehensive formula. What I am saying is, we all see things through our own lenses, no matter how hard we try to make it be otherwise, and we each and all are most assuredly wrong about some things one way or the other. They would deny to the heavens that their theology is “Catholic”, but taken to its logical conclusions it is very much sacramental – and they hold the keys to access to it. The actual Reformers would be spinning in their graves. Anachronism is (by definition) a thing belonging or appropriate to a period other than that in which it exists. Do you really think that the Greeks (around 400 BC) and their political system(s) are by any means an example to follow by in the Christian Church 400 or 2400 years later? Jesus did not commended their system to His Church! He established 12 Apostles and ordained for every of His local churches a plurality (elders always in the plural!) of men as elders/pastors=shepherds/overseeers. (By the way: Why imitate the Greeks and their system of democracy? There were many other systems of political (!) administration and power in use then and since. What made the Greeks superior to the other systems of political power, if so? Take Ceasar-Augustus and his (their) rule: quite a few people enjoyed living in the Roman empire with its famous Pax Romana (27 BC, lasting a good 200 years). Back to today: The same spirit that wants an (indirect) democratic elected “Commander in Chief” and “President” in the political realm in the US (a new idea, 200+ years) creeps into the church of Christ (2000+ years). So, basically the political system and the Church of Christ should be ruled, guided and administered by the same principles? Really? Who said so? So, we must check our philosophy against The Truth. You remember, when The People of God of old wanted a king, their argument and motive was: “There shall be a king over us, that we also may be like all the nations, and that our king may judge us and go out before us and fight our battles.” (1Samuel 8:19-20 ESV). BE LIKE ALL THE NATIONS! This is the wrong reason for anything in His Church. By listening to Jesus Christi (the non-elected President of the Church) we get the final evaluation of such a way of thinking and get a strong “advice” for the Christian church: “The kings of the Gentiles exercise lordship over them, and those in authority over them are called benefactors. But not so with you. Rather, let the greatest among you become as the youngest, and the leader as one who serves.” (Luke 22:25-26 ESV). In the epistles Jesus elaborated on how that should be implemented in His Church. So, my argument is not foremost an argument against any anachronism, but just a reminder of the danger of un-Christian (! ), unbiblical thinking in His Church. Do we really want to be LIKE ALL THE NATIONS? In the epistles Jesus elaborated on how that should be implemented in His Church. Okay, I have had some coffee now and perhaps I can speak more clearly. FWIW I really am a native English speaker regardless of any evidence to the contrary. Your sentence above is at the heart of the matter of some things about understanding the epistles. Many people think that the canon of the NT was inspired by the Holy Spirit regardless of who was the human author, and that one could say that it is therefore the thinking and instructions of Jesus on the assumption that Jesus and the Spirit do not disagree with each other. Many people do not exactly think that, apparently, and think that what Paul said was Paul and not to be taken quite that seriously. And some of us think that there is a mixture in the epistles; that Jesus did not wish that people would go ahead and castrate themselves, for instance, but that the epistles must be approached as inspired none the less-not forgetting the role of reason and, yes, traditional understanding of scripture in the process. But this battle for the mind, as it is limited to Christianity, really is about the bible and how one views the normative function of scripture, if any. And in many ways and to varying degrees for many people the battle for the mind starts with politics/economics/social structure and then ‘seeing’ the substantiation for some particular view in scripture. Same answer to both – they tend to be Reformed cessationists for whom the only genuine manifestation of the Holy Spirit is in (theologically correct) preaching and (properly administered) sacraments. I am familiar with the arguments for cessationism, and found them thoroughly unconvincing …. In the US, the president is elected by the people for a specific role for a specific amount of time. The role has “responsibilities” that are to be fulfilled by the person elected. More and more, the role is being used to promote ideology with the person in the role becoming more and more authoritative. I’m seeing it in government and the church. The people scream for a king, over self government. Not sure where this bold quote came from, but I believe it was Paul who suggested these functions. I don’t see where it was ordained. Local churches were also told to choose from among themselves — who elders. This is so true, yet so many refuse to believe it and want to ostracize those who differ. How was that substantiated? Getting cancer from umbilical leadership that is . . .
Ha! That is a funny spell check fix!! PS – me thinks we have two “JACKS” in the mix, a German Jack and an American Jack? Hi Dale. Thanks for your kind words to my fellow Catholic. I would gently remind you that our church structure has been around from, oh, the beginning of Christianity. Not saying every leader has been a saint, we have had our struggles, but so has every other Christian Tradition. I can relate with Wade’s description of abusive authority;in the student handbook of the Bible College I attended (Christian Heritage in San Diego) it stated that the college was “en loco parentis” or, in place of the parents. My parents would have never placed upon me burdens that they couldn’t bear. In a case “where all are corrupt” or all are “simply wrong” how come that you are (still) a member of such a “church”? So that’s your solution? No options for fixing the church are allowed? I think that’s a poor choice. Umbilical leaders- I think you’ve coined a great new phrase! Many people do not exactly think that, apparently, and think that what Paul said was Paul and not to be taken quite that seriously. Interestingly, Paul himself differentiates between ‘this is from paul’ and ‘this is from the lord’. Paul himself differentiates between ‘this is from paul’ and ‘this is from the lord’. Precisely, which leads to my third position in my comment, that some of us think there is a mixture of both. But here is the thing, does one draw the line where Paul specifically draws the line and only there, or does one use other criteria, and if so what. And what about the other epistles-not Paul. Where I have issues with all this is that if one establishes one’s own criteria for what is inspired and what is not, then how can anybody ever know that what they think is remotely accurate, assuming of course that the individual believes all this to be an individual decision. But then I do not think sola scriptura but rather prima scripture so there can be other guidelines. But I don’t see that it is working too well for everybody to come up with their own disparate opinions on basically everything all the while claiming that what they think is what has been explained to them by the Holy Spirit. So how does the Holy Spirit come up with opposite conclusions like that so much of the time? I just have real issues with that approach. As a 3rd generation fundy baptist preacher kid from that area I’m very curious as to which church that could be. There are so many like that in the area. “does one draw the line where Paul specifically draws the line and only there, or does one use other criteria, and if so what. And what about the other epistles-not Paul. Where I have issues with all this is that if one establishes one’s own criteria for what is inspired and what is not, then how can anybody ever know that what they think is remotely accurate,…..
i really like the frankness of your comment, here. yeah, i’m frustrated up the wazoo with all this. criteria… with kids, job, roof repairs, sheet rock repairs, plumbing repairs, ailing parents, i simply don’t have time to research & manage a “what is biblical” grid. my criteria: common sense, favoring broad parameters, and embracing what is life-giving. it’s like a live action game called “Biblical” which professional christians and others are busy playing, where they’re trying to one-up, out-smart, out-talk, & otherwise snuff out their competitors — but no one will ever win. the most they can ever hope to get out of this is market share of minds — if that’s winning, i think that sheds light on what the actual goals and intentions are). i mean, since there is a bevy of perspectives on everything God & bible, seems to me it’s sensible to hold one’s views loosely and devote the time one does have fostering what is life-giving for the earth & one’s neighbors (near and far). Yes. I do not see in the bible anywhere that the final judgment is a true/false quiz on doctrine with/without an optional essay question for extra credit. I do see something about what did we do, actually do, about what needed done. An Umbilical leader in SBC is a young man who is attached to Al Mohler for nourishment (indoctrination). There are, of course, other preacher-boy Umbilical leaders who feed off New Calvinist who’s who (Piper, Mahaney, Dever, Driscoll, etc.) until they are mature enough to feed others. I thought it fit perfectly when I saw it, too! There are, of course, other preacher-boy Umbilical leaders who feed off New Calvinist who’s who (Piper, Mahaney, Dever, Driscoll, etc.) until they are mature enough to feed others. I disagree. Should say, ” until they are mature enough to feed off of others”! As always elastigirl, well put. ”until they are mature enough to feed off of others”! Agreed! When you know it all, you shut out the voices of those who God puts in your life to instruct, correct, and rebuke. Nancy2, the old model of doing church in SBC was for a fresh seminary graduate to serve in an associate capacity under a senior pastor for a few years. They were mentored by experienced shepherds, before launching out on their own. The YRR greenhorns now become “lead pastors” at SBC church plants as soon as they hit the street with their diploma! The more aggressive in their ranks enter a traditional (non-Calvinist) church through stealth and deception (lying to pastor search committees) and proceed to takeover the church for the reformed movement. The more aggressive in their ranks enter a traditional (non-Calvinist) church through stealth and deception (lying to pastor search committees) and proceed to takeover the church for the reformed movement. so wrong …… and yet churches have opened themselves to the possibility of this happening to them and other churches have witnessed the carnage and YET people remain unprotected from the stealth ….. Dee and Deb have warned people and offered help ….. so ‘why’? is this still happening so frequently? Is it ‘denial’ that such a thing could not happen within ‘our’ faith community??? since neo-Cal-ism is such a different theology from traditional SBC teachings on soul competency, how is the ‘conversion’ done of the people???? It seems, except for the elements of fundamentalism and patriarchy introduced by Patterson et al, that the theology is extremely different. Was ESS one way to crack open the SBC??? Are people so unsure of what they believe that they will go along to get along? But that doesn’t make sense, does it? I am confused by the vulnerability of so many to the stealth workings of some very unChrist-like forces. yet churches have opened themselves to the possibility of this happening to them and other churches have witnessed the carnage and YET people remain unprotected from the stealth ….. Dee and Deb have warned people and offered help ….. so ‘why’? is this still happening so frequently? Is it ‘denial’ that such a thing could not happen within ‘our’ faith community??? I think many still don’t know. Most SBC pastors have been dead silent on the issue, even though I’m sure most are aware of it. The neo-Cals control the organization that holds their retirement money. And maybe some still believe that it’s not really as bad as it seems. The people confronting it are mostly outside the churches. And a lot of Southern Baptists who’ve encountered these controlling people (like me) have walked away from the SBC because the pastors are refusing to talk about it or they got caught in a takeover. Dee and Deb have warned people and offered help ….. so ‘why’? is this still happening so frequently? Is it ‘denial’ that such a thing could not happen within ‘our’ faith community??? Speaking from a long SBC experience, Southern Baptists are a very trusting people when it comes to church leaders. The traditional SB expect pastors to be Christlike in their ministry. So, I suppose they are in denial that young pastors would behave this way – they didn’t experience that for 150 years before New Calvinism came along. Sure, there have been exceptions to this, but for the most part you could trust pastors in SBC life to be more concerned for your soul than his theology. since neo-Cal-ism is such a different theology from traditional SBC teachings on soul competency, how is the ‘conversion’ done of the people???? Well, at SBC-YRR church plants near me, the “lead pastors” never present a message of the Cross of Christ for ALL people. Indeed, they barely weave the name of Jesus into a sermon! “Reformed” theology is not “transformed” theology, so the conversion of a sinner through the blood of Christ by confessing of sin and accepting Christ is Savior is not modus operandi in a New Calvinist church. The reformed mind cannot accept that anyone can accept Christ, since they believe that each person is predestined to be saved or damned before they ever draw breath. This has been my primary concern with New Calvinist proliferation within SBC. Harvesting the elect vs. saving the lost is not one and the same in delivery of the “gospel” by Calvinist vs. non-Calvinist preaching. A Calvinist, of course, would deny this but these are two very different plans of God’s salvation which should not coexist in a single denomination. SBC was once known for its denominational gifting of evangelism around the world, with pastors and evangelists who preached the Cross with a passion to reach souls. That is now slipping away from Southern Baptists as we go forward under New Calvinist leadership. It’s as if the only thing you need to do to be “elect” is to sign the church membership covenant they put under your nose. Well, the Eternal Subordination of the Son doctrine held by some Southern Baptists should have been shouted as heresy from SBC rooftops, but it appears to have been swept under the rug except for the noble efforts in the blogosphere (thank you TWW). I suppose the problem lies with the average SB being largely uninformed or misinformed about this … but when I’ve sought to inform SB’s in my area in this regard, they just can’t believe that SBC leaders would mess with the Trinity and denial sets in, writing it off as mere debate by academics. Strange days in SBC when the masses have chosen to be willingly ignorant about New Calvinism coming in the back door. I am confused by the vulnerability of so many to the stealth workings of some very unChrist-like forces. What is going on in SBC ranks is “spiritual” … and I don’t mean Holy Spirit. Whose plan would it be to take one of the world’s largest forces for evangelism off the map? The neo-Cals control the organization that holds their retirement money. This explains a lot. The pastors may feel that they are ‘held hostage’. Exactly. And they’ve changed the name (to Guidestone) and restructured it, so now I get the impression it’s purpose now is to make more money for the neo-Cal leaders. I don’t know how that works legally with non-profit churches, but now they deal with other organizations and businesses, too. ishy, what organizations and businesses are these? do you know the nature of Guidestone’s relationships to them? if for-profit things are happening, where does the money go? seems to me the degree of secrecy reflects the degree of shadiness/corruption. Do not forget that there is no baptist catechism, no magisterium, no adherence to traditional creeds or councils and there has been nothing in place to ensure a continuity of belief from one baptist church to the next. If you have noticed how Lydia and I from the same town experienced differences of emphasis and even to some extent belief just by being in different churches in the same town. I am thinking that I am only slightly younger than her mother was. And yet she heard a lot apparently about soul competency and priesthood of the believer and I heard very little. And you read the interchange between Max and me in that he and I also experienced being baptist differently, he being in his words bapticostal and I growing up anti-bapticostal, all in the same denomination. Historically baptists have been a combination of particular baptist thinking (calvinism) and general baptist thinking (free will), the words particular and general referring to doctrines of the atonement-for whom did Jesus die. These people in SBC have sat side by side on the same pews for years and years and SBC has been a mix of ideas right on. This mix of ideas seems to be something the neo-cals want to get rid of. The want their ideas, which are really not all that new to baptists as a whole, to be the sole and dominant viewpoint. The thing that I see as relatively new is the intolerance for disagreement. It used to be that baptists, at least in my experience, were relatively tolerant of the differences in opinion about some things, if not in the same church (parish equivalent) at least in the same denomination. So, no, it is not that they are unsure of what they believe but rather that there are used to more flexibility from person to person. People did not all have to agree on everything. Which of course works for me in my new setting because the episcopalians don’t all agree with each other on everything either. Seems like home to me in that respect. So, what I am saying is that these ideas do not necessarily seem all that strange to southern baptists; a little extreme perhaps but not totally novel to them. This is an in-house struggle for which side wins out. I’m glad you brought up ‘differences of emphasis’. I remember a long time ago, a very wise Presbyterian lady told me that she thought that what appeared to be ‘differences’ between denominations was really a matter of what was emphasized. It made sense then and it makes sense now. I have a lot of sympathy for people who find that their church has been ‘hijacked’ by some stealth pastor of the neo-Cal persuasion who comes in and attempts to institute a controlling and abusive climate for members. I have a lot of sympathy for people who find that their church has been ‘hijacked’ by some stealth pastor of the neo-Cal persuasion who comes in and attempts to institute a controlling and abusive climate for members. I doubt that he could get that done unless he had some members who agreed with him and joined him in what he was trying to do. And I doubt you would find a baptist church where some new pastor would not find somebody to side with him pretty much regardless of what he was trying to do. I am saying, it is probably not just the pastor to blame. In my current parish the vestry et al voted in a rector whose ideas, while within normal limits for TEC, none the less was over at one end of the protestant/catholic continuum which was opposite of the rector before him. There are two cadres of people who have intense feelings about all this, one on one side and one on the other. I think the whole thing holds together possibly because of all the new people who have come in. Perhaps this is the same sort of thing that happens in the neo-cal ‘takeover’ of existing churches. is there anything as dramatic in the two ‘sides’ of your parish as there is with neo-Cal introduction of the ESS concept into an SBC Church? I think Lifeway may be one of them, but yes, they don’t completely share these this information. The name was changed with a vote in 2004, but I think the restructuring has been ongoing and probably was not fully shared at the convention. I would think they’d have to be legal, but I doubt they are doing things the way Christians would expect. And the fact that so many pastors in the SBC seem terrified to speak out tells me more is going on, but maybe Max or mot can share more about that, as I am not Southern Baptist anymore. Interesting article, Jerome. Even with different theologies, it seems like the methodology is very much the same. Hmmmm … sounds like some young Catholic whippernappers are taking their lead from New Calvinists to do their own version of a new reformation. Good Lord, the youth group is trying to run things in both Protestant and Catholic churches! Well of course they declined to respond. They never respond to impertinent questions. They preach. They speak. We obey. Or leave. When they say we can go, that is. The P&R had their Federal Visionaries who had recovered the “real” faith, too, and they had no tolerance for those who were too stupid not to get it, just like the Baptists have SBTS and 9Marks who think the rest of us are too stupid or unregenerate because we do not agree with them. I’m thinking that hubris is not bound by theology. Several years ago, I worked in a managerial role at a company which hired a new CEO. He called all the company executives into a meeting on his first day and said he had been hired because we worked hard but not smart. After other choice lines of that sort, I couldn’t take it any longer. I advised him that the good people in that room had worked hard enough and smart enough long enough to create a company which had landed him a good job. I barely outlived his tenure at that company – he made things difficult for me. Al Mohler, Mark Dever and other SBC New Calvinist leaders need to pause and reflect on who the good people are that are paying their salaries. But, I’m not sure I have enough years left to outlive their influence and tenure in the SBC. They are an aggressive bunch. I wonder if the problem is the seminaries themselves and the way they operate. You see a similar arrogance among young graduates from secular colleges. They all think they’re going to save the world somehow. Back in the frontier era, seminaries were often nonexistent. You didn’t need any special book larnin’ to be a pastor, except the Good Book itself. While this certainly had its drawbacks, it also helped stop the phenomenon of pastoral elitism and “ivory pulpit” syndrome. Given the easy availability of theological and pastoral resources on the Internet now, I wonder if there is even a real need for seminaries anymore, or if their sole function now is to churn out guys who see themselves as spiritual elites. i think it’s partly just ‘youth’. I’ve noticed all college students graduate with a know-it-all complex. (i’m sure i did, too). The school of hard knocks they all unwittingly enroll in helps to cure this annoying thing. Sounds word-for-word like a description of SBC-YRR church planters! “MAKE THE CHURCH GREAT AGAIN!”? Practice for “TAKE BACK AMERICA AND RESTORE OUR CHRISTIAN NATION!”? Hmmmm … sounds like some young Catholic whippernappers are taking their lead from New Calvinists to do their own version of a new reformation. Except with 24/7 Rosaries and Tridentine Latin Mass. I have read both Fraudulent Authority and Radically New and both are refreshing, challenging, thought provoking and well written. So why isn’t anyone posting reviews on Amazon? I saw one on Fraudulent. None on Radically New. Fundamentalism with Rosaries and Tridentine Latin Mass. So why isn’t anyone posting reviews on Amazon? We are ruminating profoundly, positively, and gathering our thoughts, after a very satisfying good read.